Days before Hurricane Florence began pummeling the North and South Carolina coasts with its powerful winds and 13-foot storm surge, Harris technology—from space to ground—was helping meteorologists predict and inform, emergency managers prepare, and residents take action to protect their lives and property. More than 22,000 miles above Earth, the Harris-built Advanced Baseline Imager (ABI) on NOAA’s new GOES-East weather satellite was collecting and sending forecasters at the National Hurricane Center and elsewhere detailed weather imagery that gave unprecedented insight into the structure around the eye of Florence and let them pinpoint the storm’s exact location and accurately forecast its track and intensity. Compared to instrumentation on the previous generation of GOES satellites, ABI delivers three times more spectral information at four times the resolution and five times faster. Imagery is updated every minute, and in some cases every 30 seconds. Making sure that all of that new data got into the hands of forecasters as quickly and reliably as possible was the GOES-R Ground System, also built by Harris for the National Oceanic and Atmospheric Administration (NOAA). This sophisticated, enterprise class system not only controls the GOES-East satellite, ABI, and the other onboard instruments, but also receives the raw data from the instruments and processes it in less than 30 seconds into products for distribution to the U.S. National Weather Service and more than 10,000 direct users. The GOES-R Ground System can process more than 16 terabytes of data every day, with 40 trillion floating point operations per second data processing power and a system uptime greater than 99.9%. When lives are at stake, this type of processing speed and reliability is critical. As Hurricane Florence swept across the Atlantic, fueling its growth into a 400-mile-wide storm that flooded rivers and streams across both the Carolinas, another Harris-built instrument was at work in polar orbit 512 miles above Earth. The Cross-track Infrared Sounder (CrIS), a hyperspectral infrared sounder on board NOAA’s Joint Polar Satellite System (JPSS) series, was collecting and feeding more data into weather models used to help predict the storm’s path and intensity. Hyperspectral infrared sounders focus on hundreds of very narrow spectral bands, enabling detailed measurements of temperature and moisture that improve the accuracy of weather forecasts more than any other type of data, according to the National Academies’ 2017-2027 Decadal Survey for Earth Science and Applications from Space. 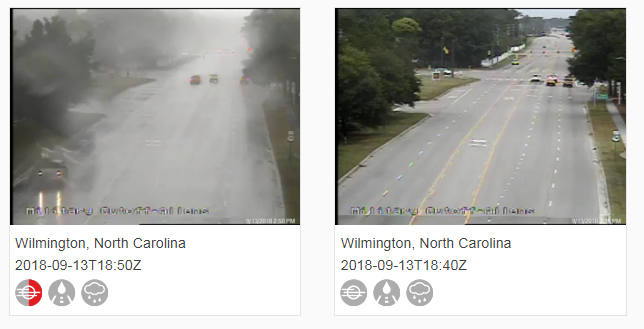 Helios® draws from thousands of traffic and web cameras to provide real-time weather intelligence. To help emergency managers, transportation officials, and residents in the path of Hurricane Florence, Harris provided free access to its powerful Helios® real-time weather intelligence tool. Helios® uses machine learning to automatically filter through thousands of traffic and web cameras in the Helios® network. It flags those that are detecting hazardous road conditions, such as pooling water, to improve the efficiency and effectiveness of disaster response and recovery.